The harmful effects of pollen could be a driver of herpesvirus infection in horses, the findings of research suggest. Pollens are well-known triggers of respiratory allergies and asthma, but little is known about how they interact with the respiratory membranes – the mucosa. It is generally believed that pollens, when inhaled by animals and people, release an abundance of proteins when they come into contact with the moisture in the respiratory tract. These include allergens and proteases – enzymes that cause a breakdown in proteins. Researchers from Belgium’s Ghent University set out to investigate whether these pollen proteases play a role in impairing the epithelial barrier in the respiratory tract, normally preserved by bonds that form between the epithelial cells. Jolien Van Cleemput and her colleagues focused their study on the pollen proteases of Kentucky bluegrass, white birch and hazel. The study team, writing in the journal Scientific Reports, carried out a series of tests on equine tissue samples in the laboratory. These showed that these proteases, normally found in the pollen wall, destroy the integrity and anchorage of respiratory epithelial cells, but not the basal cells. 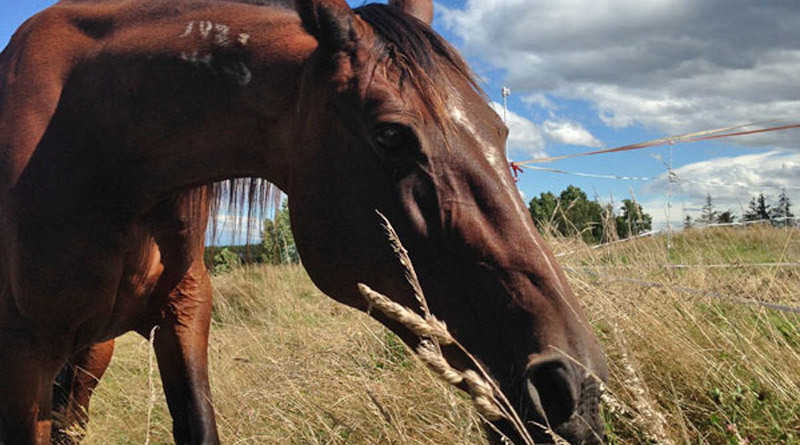 Further, they showed that this pollen-induced damage increased the opportunities for equine herpesvirus type 1 (EHV1) to infect horses. Indeed, they described the ability of EHV1 to infect the damaged tissue samples as greatly enhanced by this failure of the epithelial barrier. Discussing their findings, the researchers said the damage caused to their tissue samples by the pollen-derived proteases was clearly irreversible. Just 24 hours after exposure, only a thin layer of basal cells remained intact. The normal microscopic hair-like projections that cover the epithelium were gone. It would be interesting, they said, to study the regeneration capacity of the respiratory epithelium in horses – something that couldn’t be done with tissue samples in the laboratory. EHV1 is known to target a receptor at the basolateral side on the surface of epithelial cells. Therefore, the virus was more easily able to infect cells whose intracellular junctions had been compromised. Fortunately, the basal cells remained able to seal the epithelium, even when exposed to pollen proteases. This prevented giving the virus “completely unlimited passage”, they said. Nevertheless, these base cells were still exposed to the virus particles, enabling efficient infection. The study team said their findings are supported by the fact that EHV1 infections occur most often during late winter and spring, when outdoor pollen concentrations peak. Besides the herpesviruses, other airborne pathogens might also take advantage of this pollen-induced barrier dysfunction, they said. The full study team comprised Jolien Van Cleemput, Katrien Poelaert, Francis Impens, Wim Van den Broeck, Kris Gevaert and Hans Nauwynck, from Ghent University; and Kathlyn Laval, from Princeton University in New Jersey.